Are you sending effective direct mail offers? SurveyMonkey Audience compared four different mailers against each other to identify messaging that consumers preferred most. 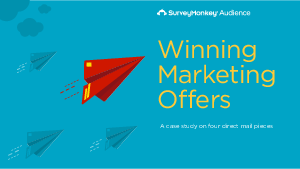 Get the Guide to Developing Winning Marketing Offers to see how to test your ideas with surveys. Download this 19-page guide to learn which of your marketing mailers will win before going to print.